Beloved San Francisco Journalist Herb Caen waxed romantic for the seven hills of San Francisco, likening them to the seven hills of Rome and its pioneering spirit, but in fact, San Francisco has no less than 74 hills. 74 points on top of this amazing landscape, 74 chances to glimpse the bay or the sunset or the ocean. 74 chances for good cardio and 74 communities and neighborhoods teeming with lives, history and stories. The Potrero Nuevo Project imagines some of these lives and stories and we invite you to join us, February 2-19 at Potrero Stage, as we explore the stories of This Hill - Potrero Hill. Sometime around 10,000 years ago, the Native Americans, the Ohlone people, settled here and in all of the territory between San Francisco and Monterey Bays. The evolution of their race took them through hunting and gathering to farming and artistry and for hundreds and hundreds of years made the most out of the abundance of this sunny hill. Beautiful abalone shell jewelry and basket remnants are just some of the artifacts still being excavated today. The Ohlone met The Spanish Missionaries in the early 1700s, unfortunately, not to their benefit. The Missionaries wanted them to practice Christianity instead of their own traditions and brought incurable disease to the Ohlone people. When the Spanish Missionaries first came, there were over 50 Ohlone groups, numbering in the tens of thousands of individual citizens. By 1850, the Ohlone population had shrunk to just 874, with the last native speaker passing away in 1939. Today there are an estimated 500 people who have Ohlone heritage from this specific region of California. The Spanish Missionaries also brought a whole new tribe of people to this part of the world, the Californios, people of Castilian descent born in this region under Spanish control. They were people of prominence, often given property and moderate wealth. Playwright Ignacio Zulueta begins our evening with a witty sitcom about two of Los Californios and they unlikely role they have to play to appease the new church and maintain their position. It was in the late 1700s that Potrero Hill got its name - from the Californios who grazed their cattle on this open landscape of shrub and grass, naming it Potrero Nuevo or New Pasture. Mexico gained independence from Spain in 1821. In 1844, the Mexican government granted Potrero Nuevo to Francisco and Ramon de Haro, the 17-year-old twin sons of Don Francisco de Haro, then mayor of Yerba Buena. Patricia Cotter’s play, The Crossing, brings into sharp focus the moment when Ramon and Francisco’s lives intersected with Kit Carson and changed their destiny and that of Potrero Hill forever. It is impossible to wander through the history of San Francisco and not be awestruck by the immense power, devastation and ultimate transformation that was the 1906 earthquake. The survival of the city depended on the neighborhoods both to the north and south of Market street. To accommodate all the homeless refugees and displaced people, the U.S. Army set up Tent Cities in Pacific Heights and on Potrero Hill, with a large population of Russian and Slovenian immigrants moving to the hill. The problem of homelessness in 1906 is in stark contrast to the similar problems we face today, although it is gentrification and not tectonic shift that is the catalyst. Martha Soukup imagines a these two eras colliding and the different ways in which the inhabitants of the hill dealt with the same situation more than a century apart in her play, Tent City. From earthquakes to manufacturing, the early 1900’s through the 1940’s brings Potrero Hill into the age of industry, producing strong-willed people with even stronger ambitions. Much like the gold rush of 1849, the docks brought people from all over the world to make the new armadas. 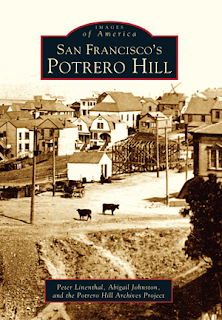 Over half of Potrero Hill's population at this time was Irish immigrants; Scots, Swiss, Russians, Slovenians, Serbians and Italians made up most of the remaining population. Native born whites made up less than 20% of the population. Today, the remnant of these ethnic groups' heritage is still visible, such as Slovenian Hall on Mariposa St. and the First Russian Christian Molokan Church on Carolina St. On the Docks by Garret Jon Groenveld chronicles one young man’s journey from Boston to San Francisco right into the birth of the union movement, which found its line in the sand on Potrero Hill. Did you know that all the streets are named after the ships that were built on the docks, and the ships were named after states. Missouri, Carolina, Connecticut, Arkansas...All great ships built just a few blocks away. Another great story of the shipyards, actually has its roots in the railroad and one man’s incredible contribution to both chapters of history. Lim Lip Hong was a chinese immigrant who spent more than a decade building the railroad across the great west. He set up a ranch in what is now dogpatch that competed with, but was never eclipsed by, the booming shipbuilding industry all around him. Victoria Chong Der channels the ghost of Lim Lip Hong in the story of GraceD - an intertwining of two of his descendants as they face the challenges of the modern world. Genevieve Jessee also has her characters struggling with the challenges of the modern world, but now it is today and the challenges are a lack of affordable housing and the memories the neighborhood holds for its longest residents. Walls Come Tumbling Down examines the painful truth of a family’s memories and the impossible separation of who that family is because of where they come from. Under the plan, REBUILD POTRERO, the controversial projects which housed some 1200 people, are being torn down and replaced with mixed-use buildings and condos, SOME of which will be Below Market Housing. But for the majority of the people who have lived here, and raised generations here despite crime and poverty, their lives have been displaced and it is unlikely they will return. Truly it is about the people of this hill that makes it legend, and there have been many famous folk who are part of the hill’s narrative, actor Danny Glover and painter Wayne Thiebaud; Kevin Starr and O.J. Simpson; but it is also about the ideas, the art and the politics that were born here...Oh, and Beer. Beer. America has been in a whirlwind romance with beer since the 1600’s and it has made quite a journey, from homestead brewing to commercialization back to small craft batches. And the quintessential American Beer Story is the story of Anchor Brewing and it’s unlikely hero, Fritz Maytag. Fritz in his twenties, was a man waiting for his dream and he found it in a failing, unpredictable brewery. Ruben Grijalva introduces us to the key players and key moments that made Anchor Steam Beer one of the best beers in America. And they don’t pay us to say that! The play Full Steam Ahead will take you on Fritz’ journey and probably make you a little bit thirsty….Anchor Steam Beer will be available in the lobby…. And we can’t leave the evening without a glance into the possible future of the hill. Potrarium Unbound by Maury Zeff thrusts us into the not too distant future and shows us that the values that have made this hill the unique and rich place it is, don’t weaken or fade simply because the technology pushes us ahead. We are so very honored to be able to tell just a few of these stories and to share the lives of just a few of these amazing characters. We hope you will come and see The Potrero Nuevo Project, and that you will spend some time in this neighborhood and make it a part of your story. This article, written by PlayGround Associate Director Annie Stuart, was originally presented live by Jed Parsario and Karen Offereins at the grand re-opening of Potrero Stage on Saturday, January 28, 2017. LOVE this concept - intersection of her-his stories and live theatre. Brava / Bravo PlayGround !